High deflection shock and vibration isolators for medium-weight sensitive equipment. 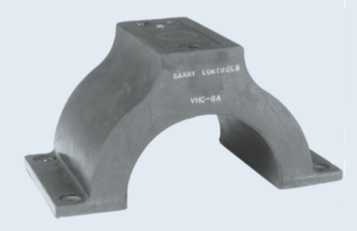 Barry VHC-Series mounts are special purpose, mid-frequency isolators designed to protect sensitive equipment when high level shock and vibration inputs are expected. Typical applications include electronic equipment installed in mobile equipment subjected to off-road environments. Maximum loads apply when mount will be subjected to an 18″ freefall. Larger loads can be accommodated for less severe shock inputs. Barry LT (low-temperature) Compound, which is ideal for military applications, operates between -67°F and +180°F (-55°C to +82°C) and is resistant to fungus and ozone. Neoprene has an operating temperature range of -20°F to +180°F (-30°C to +180°C) and resists oil and ozone.